Cliff Electronics is now offering panel builders and system integrators a user-customisable connectivity option. The new XRP Customisable Recessed Socket Plates continue to use the popular XLR panel cut out and allow users to fit a connector of their choice or retro-fit a connecter to a system at a later time. This facility could be particularly useful for non-standard or more esoteric connectors not easily available from component suppliers. The blank XRP socket plate also allows for cables to be passed though using a grommet or cable gland and push buttons or LED indicators to be mounted. They offer 3mm and 12mm recesses to accommodate low profile and deeper connection options. They are available in black plastic and nickel or black finished metal. 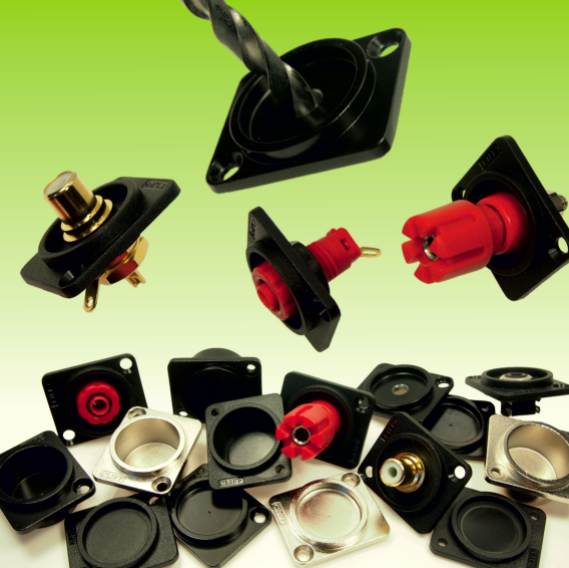 All versions are available with countersunk or plain mounting holes and metal versions can be supplied with an M3 thread in the mounting hole. The new Customisable Recessed Socket Plates are provided with a drilling guide in the centre of the connector mounting area to ensure correct assembly. They can be mounted into the 19” rack panels provided by Cliff for users to configure or for factory assembly.